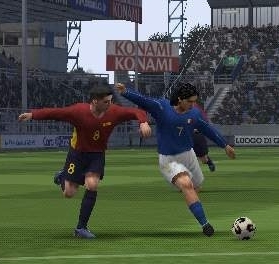 Winning Eleven 9 Ubiquitous Edition per PSP: Voto, video e "hands-on"
Manca una settimana esatta dall'arrivo sugli scaffali nipponici di Winning Eleven 9 Ubiquitous Edition per PSP e finalmente siamo riusciti a mettere le grinfie su qualcosa di concreto e succoso. Fino a oggi abbiamo potuto ammirare praticamente solo immagini del gioco, ma ora abbiamo a disposizione un bel video di circa 60 megabyte, giusto per la gioia degli occhi. Come se non bastasse, non leggere se il tuo cuore è debole o hai problemi di salivazione, ci si mette pure Famitsu che ha affibiato al calcio portatile Konami un voto da killer app: 9/9/9/9 che fanno la bella media di 38/40, a un passo dall'Olimpo. I only saw it in the big Sofmap. I picked it up and the game was set to Australia vs Japan. I exited out (waiiiiiiiiit....) and changed to 'the filthy scum' (Man Utd) vs Korea ( i just picked anything). The main menu screen is identical to the PS2 version - minus the master league mode. Loading screen is the same too (grey screen, scrolling bars at the bottom). The graphics are truly lovely - they really are. It's not PS2 quality, but it's nice and it FEELS like WE... i'm just not sure that it feels like WE9. It also seemed a tad slower than WE9 - not sure if it was due to me usually playing on Wide and being forced to use "normal" view. Normal modes - Normal close, mid, and distance - NO WIDE. :( Given the slowdown in normal, i assume this is to stop the PSP choking. seemed to be.... every ball pumped forward that caused a number of players to be on screen and it started slowing down. It's still awesome, it makes fifa look totally stupid for a start. but i think 4 9's is a bit too high. I'm sure the next version will humiliate this one. It's a very good start. Oh, and playing on the Dpad HURTS. I switched to analogue (NOOOO I DON'T WANT TO PLAY ON ANALOGUE!!!) and that felt worse. I guess i just have to start punching sand to toughen up my fingers or something. The referees weren't as whistle happy, but my main beef with the PS2 version is that the CPU will rough you up, but the second you do it back the ref blows instantly. With the physical side seemingly muted/toned down, i didn't give many fouls away at all. Oh. player models are very nice. Giggs looked pretty much spot on. Winning Eleven 9 Ubiquitous Edition per PSP sarà sugli scaffali giapponesi (e import) a partire dal 14 settembre 2005.